Author: Ростислав Винар ( 15.11.2015 10:24 ). We offer you a serious polemical article on the recent developments in our movement, written on behalf of the Dnipropetrovsk OO NLM "the Right Sector" by our fellow Rostyslav Vynar. The work is great, interesting, and deserves careful reading and constructive discussion. A detailed opinion of the Dnipropetrovsk regional organization NLM "The Right Sector"
During the last week in the life and activities of the National Liberation Movement "The Right Sector" a number of things happened that can implicitly and directly affect the further development of the nationalistic movement, the historical path of Ukraine and Ukrainian people. These events required a rapid and comprehensive review, response, and explanation from the movement “The Right Sector”. And such explanations are provided in the form of statements from various people, "authorized" in one way or another, or as "personal and painful." But sometimes they are served in a format, which in turn requires a response by asking further questions rather than providing clear answers. To stay away from this controversy, to hide in the shell of pseudo-neutrality means to leave our brothers, fighters, and activists in lurch. Concerning some of these statements we would like to draw attention of all the supporters and members of “the Right Sector” movement to certain explaining circumstances that remained outside the column. Author: Tertsiya ( 12.11.2015 17:32 ). Dmytro Yarosh left the "Right Sector" to build a political career. > Fact: Dmytro Yarosh said about the inability to be a "figurehead" under the direction of unproductive forces. One thing that Dmytro Yarosh strives for is USSD (Ukrainian Independent United State). D. Yarosh left because he was afraid that after the arrest of G. Korban, he would be the next persecuted companion of I. Kolomoiskyi. Fact: D. Yarosh has done nothing to be persecuted. He performs no questionable economic activities, does not incite people to crime, says no groundless public statements. The so-called "conference", where another Leadership has been elected, was attended by representatives of all departments of UVC PS and branches of the party "Right Sector". Fact: a very small part of the branches and divisions participated the conference; some of those were disoriented, because they were incorrectly informed about the purpose of the event. The decision of Dmytro Yarosh to resign was affected by the Security Service agents, who intruded into PS. Fact: the Leader is the Leader, because no agents, no wolves in sheep's clothing who pretend to be friends, are unable to influence his decision. Security Service agents and the Kremlin do not accept a resignation of the Leader and rock the boat of PS to destroy the organization. Fact: all combat battalions, the most dominant party branches, the headquarter of the UVC, information department of UVC and other structural units of NLM "Right Sector" are aware of the destructive nature of the changes that the newly elected members of the newly elected Leadership want to push. The combat battalions, units of UVC and others say very explicitly "goodbye" to all double agents and cancel out all their efforts to marginalize NLM "Right Sector". Dmytro Yarosh can lead the party "UKROP". Dmytro Yarosh can lead any party, but better OSCE, NATO and NASA (all together). Dmytro Yarosh left because he refused to support openly I. Kolomoiskyi, who stopped financing his. Fact: NLM "Right Sector" sincerely thanks to all those supporters and volunteers whose love for Ukraine and faith in us have resulted in such strong support that even oligarchs envy. Fact: Dmytro Yarosh is ready to continue the struggle for the common goal: Ukrainian Independent United State. Author: Дмитро Ярош ( 02.11.2015 09:29 ). The development of situation in the country requires from you to take the correct and decisive response to the challenges that life and Putin present. The situation with the elections in Mariupol is one of the main challenges. There are two ways. First, do what America, Germany, and Putin demand from you, and hold elections on November 15 this year. BPP (Petro Poroshenko Bloc) together with Opposition Bloc can vote for this issue in the Verkhovna Rada of Ukraine and finally bury the pro-Ukrainian coalition. There is the second way: give a chance of recovery to the region, assign the elections to a later time, and conduct some reforms in the region during this period. The situation in Mariupol can be used as a road map and a kind of experiment, that can become the example for developing a scenario of further socialization in the currently occupied territory of Donbas. Before making the decision, the situation in the city should be studied without false templates and deceptive slogans, taking an honest look at the reality. Author: Tertsiya ( 31.10.2015 19:19 ). The Ukrainian people, after decades of walking in neat rows under the sign of “sovok” (Soviet Union), finally proclaimed independence. However, they didn’t select a new ideology as a guide for their social development. Eventually the lack of ideology turned into the lack of principles, more precisely into the tolerance to antisocial behavior (violation of the law, in simple terms) and perverse thirst for enrichment. Those who come to the helm, manage the state as they deem it fit, but their personal competencies, beliefs, preferences, and principles (or rather, lack of principles) we usually learn after the fact. Worldview of a person, who by the will of fate in any given period of time occupies the presidency, despite the knowledge of foreign languages and the ability to distinguish between debit and credit, may very well remain at the level of a medieval haggler, especially if about the debit and credit he learned not from university professors but from third-rate moneylenders. Author: ідеологічний референт 12 ЗБАТ ДУК ПС друг Сірий ( 13.10.2015 22:06 ). The third week in a row on checkpoint Kalanchak I stare into the eyes of people crossing the administrative border with the occupied Crimea. The expressions differ. Eyes of truck drivers, deprived of earnings, were moving around all of us, hoping to find a weak link. However, in the eyes of a guy, who did not reach potatoes to the Crimean market and in hearts unloaded 20 meshes of potatoes to the right wingers ("at least you eat, guys! "), still flashed something - if not understanding, then, at least, an attempt. Eyes of the taxi drivers, who charge fifteen hundred hryvnyas to the novices to drive to Kherson, are tenaciously clutching at everyone and, when realizing that you are not their client, sliding further. People in their own cars look calm; they must be often crossing the administrative border. But those who are leaving for good are eyeing everything closely, as if want to remember something. And those traveling from the peninsula are looking around with zest - where else could they see a vivid conversation of a Ukrainian border guard, a Tatar-fighter from the battalion “Aidar”, and a Rightwinger. 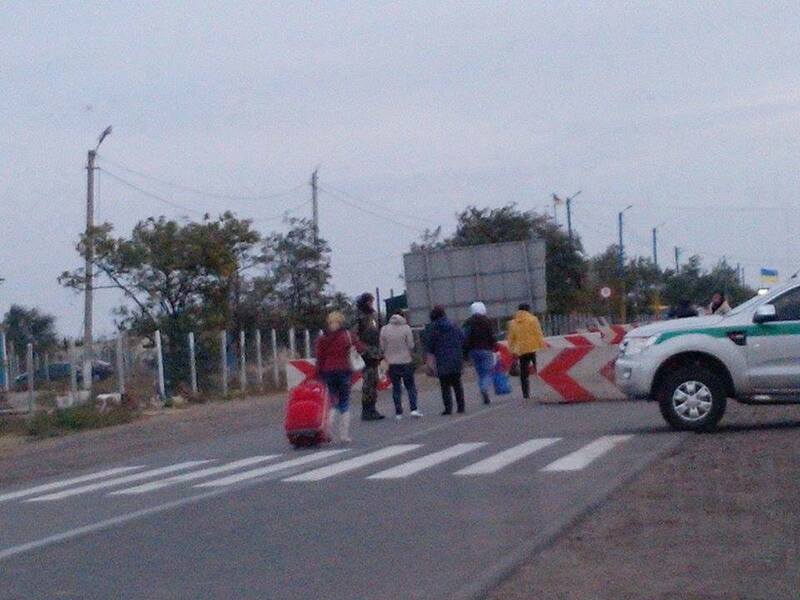 Often I pay attention to those who pass the checkpoint on foot, pulling suitcases on wheels, maneuvering between the concrete blocks and cars. People are passing the border procedures silently. Stretched as a chain they seep through the invisible and incomprehensible to many border to the buses. Mainly elderly. There are some young people. Men are much less than women. I cannot catch their eye expressions - they often just look down, but most of the time they divert their eyes from the people in uniform. Yes, everyone has, if not tragedy, then story. Since November 2013 I listened to a lot of them and now, occasionally, I begin talking to the people. Someone in the Crimea left behind parents, others - children, one cannot leave behind the apartment, must visit it periodically, quite a few active women of retirement age was in the Crimea on vacation. Each one has her own explanation of the occupation and blockade. For example, a retiree from Kryvyj Rih simply explained: I had a good job; I get a good pension, why should I not be able to vacation in the Crimea? And I would like to understand them, to help, even to comfort. However now I remain silent. It was after trying to greet the newcomers from the Crimea with the usual "Glory to Ukraine!" In return they just started faster loading onto the bus. No, I am not trying to divide citizens of Ukraine on continental and peninsular. While "Russia, please come" was shouted in the Crimea and Donbas, tears were in the eyes of Ukrainians across the entire Ukrainian land. The Right Sector lit the flame of the revolution on Maidan, its Ukrainian Volunteer Corps stopped the Russian aggressor in the Liberation war on the East, and now the right wing volunteers block the occupied Crimea for the sake of a single unified Ukrainian nation. I will do everything so the eyes of millions of Ukrainians I have never seen or knew and who have no real estate in Yalta or relatives in Simferopol, and who will never go on vacation in the Crimea, or profit on difference in prices, become warmer. Let the tears of mothers from Frankivsk and Cherkassy region dry out, let there will be no anxiety in the eyes of children in Odessa or Luhansk, and let the wives from Rivne and Uzhhorod see their mobilized men alive. Just that. And until then I will patrol the checkpoint Kalanchak with my fellows, and even without getting an answer, I will continue to say “Glory to Ukraine!" to the silent people that are coming from their parents, or to their estate, and some because of business, or to the Crimean vacation, to all who are crossing the administrative border with the occupied Crimea ... temporarily occupied Ukrainian Crimea. Author: Олена Білозерська ( 05.10.2015 10:06 ). This is a very important text that I nurtured for a few weeks. Please don’t be lazy and read through to the end. People who are far from the front line and are used not to trust the official sources are seeking to learn from those who are "geographically closer to the truth": whether the truce is really observed, or the officials are lying and the fighting keeps going? I'll tell you what really is going on. Author: Ідеологічний референт 12 ЗБАТ ДУК ПС друг Сірий ( 28.09.2015 11:12 ). Today there is no fool or obtuse person in Ukraine. The president, government, parliament officials-oligarchs are celestial. I say about us, usual. We are all intelligent and patriotic. Perhaps if we cut from the global network a piece of the Ukrainian Internet and by Ukrainian technology transform it to an energetic drink this would be enough to fly around the solar system three times and to plow a neighbour’s field a little. If we get together all suggestions of the way how to get out of the crisis-win Putin-build the state, by the Soviet criteria of obtaining academic titles we would have somewhere half a million of good Ph.D. and doctoral degrees. If the level of theoretical patriotism translates into action, there will appear the Great Ukraine from the Baltic Sea to the Black Sea. Author: Андрій Стемпіцький ( 23.09.2015 13:51 ). Being busy with the blockade of Crimea, we should not forget our prisoners, Transcarpathian fighters. Help and support is needed by all those who are behind bars. And while some are in captivity, the others who are free, should triple their efforts in the fight against organized crime authorities. Let each of us do what is possible and what we can. And another thing, squabbling and fighting for who is bigger nationalist is petty and ridiculous at a time when the system destroys everyone who has not gave in to its brutality, cynicism, and anti-Ukrainian nature. Let us not judge one another, and let history judges who and how much contributed to the liberation of our Motherland. Perhaps through different ways, but onward to the victory! Either all win or shame of defeat will also be one for all. Author: Андрій Стемпіцький ( 22.09.2015 08:54 ). Today there is no change to the blockage action. More trucks turned around and left. Others are waiting for a miracle. In addition it would be nice if the Ukrainians in the regions bordering Russia would show initiative. I am not even talking about the Luhandon (Luhansk and Donetsk regions combined). Anything is possible when everybody team up on one job and do not use such actions for their own PR or election campaign. Also, thanks to "Khorvat", "Tataryn", and all soldiers for such efficient operation. The head of information services of the Right Sector Olena Bilozerska about the blockade of Crimea. Author: Олена Білозерська ( 21.09.2015 20:17 ). Right now I am far away with my unit, but all my thoughts are there, near Chonhar, with those guys - Tatars and Ukrainians, blocking the Crimea. I hope we will be ordered to go there at least for a short rotation. For sure, I will be useful there because I have the experience of standing on checkpoints. Of course, I fully support the blockade. It is a great shame that this had not been done before, by the state, not just by citizens’ initiative. They say that during a day of blockade 800 trucks have been stopped. How many of them passed for over the year and a half?